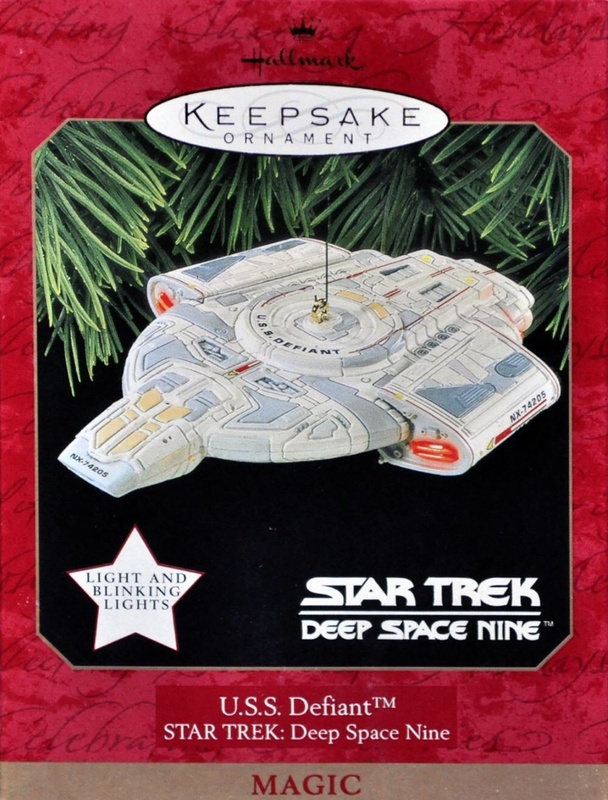 Captain Benjamin Sisko, featured in this Hallmark Ornament, has his handsful, as a father (to his son, Jake Sisko), as captain of Deep Space Nine and the U.S.S. Defiant, and as Emissary of the Prophets for the people of Bajor. And even though this takes up a considerable amount of his time, as does the shannanagins of the local bar tender, Quark, Captain Sisko still has time to enjoy his favorite pastime – baseball. 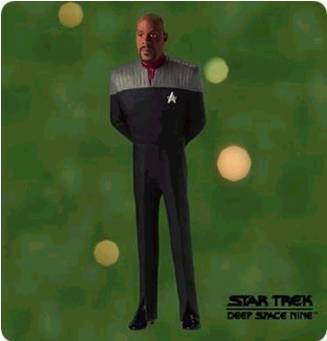 This entry was posted in 027) 2001 Sisko, 2001, Anita Marra Rogers, Characters, Master List, Sisko, ST: DS9 (TV) on October 21, 2011 by garfieldandtrump. 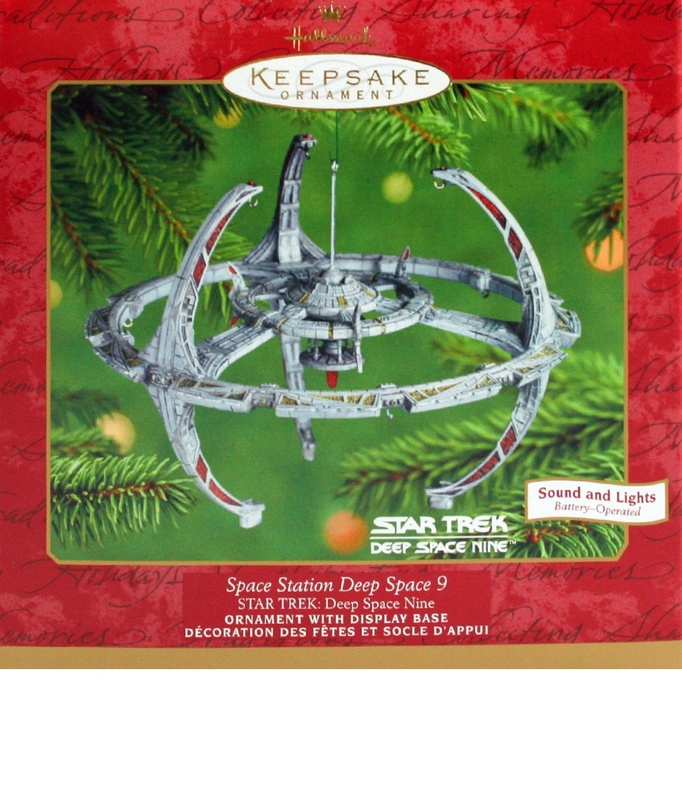 This 2001 Star Trek Hallmark ornament is a battery operated ornament with display base that features sound and light. Space Station Deep Space Nine, under the command of Captain Benjamin Sisko, orbiting the planet of Bajor, is the gatekeeper for the worm hole that leads to the Gamma Quadrant. Because of the danger that the wormhole presents, the station has become the permanent home of the U.S.S. Defiant. 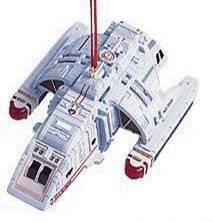 This Star Trek Hallmark ornament can become very impressive when displayed with the miniature starships of the Starfleet Legends or Ships of Star Trek sets (sold separately). Requires two 1.5V AAA batteries. This entry was posted in 025) 2001 Deep Sp. Nine, 2001, Battery, Deep Space Nine, Display Stands, Lynn Norton, Magic Voice & Light, Master List, Ships, ST: DS9 (TV) on October 21, 2011 by garfieldandtrump. Box Text: More than a century ago, in hte days when Christmas trees were lighted with real candles for brief, magical moments, European craftsmen began producing beautiful ornaments of blown glass. TheseThese treasures, called kugels, were known affectionately as “tree jewelry”. Today teh artisry of hand-blown glass ornaments is being rediscovered and given new importance at the holiday season. Whether you display these lovely treasures on your tree or mantel or feature them in a centerpiece, you and your guests will enjoytheir elegance, shimmering beauty, and brilliant colors. Each ornament has been individually hand-blown and meticulously painted by hand. The Hallmark Crown Reflections Collection…celebrating a time-honored art form that becomes even more precious as our world looks forward to teh drawing of a new century. This entry was posted in 024) 2000 Worf/Glass, 2000, Anita Marra Rogers, Blown Glass, Master List, ST: DS9 (TV), Worf on October 21, 2011 by garfieldandtrump. This entry was posted in 019) 1999 Worf, 1999, Anita Marra Rogers, Characters, Master List, ST: DS9 (TV), Worf on October 21, 2011 by garfieldandtrump. 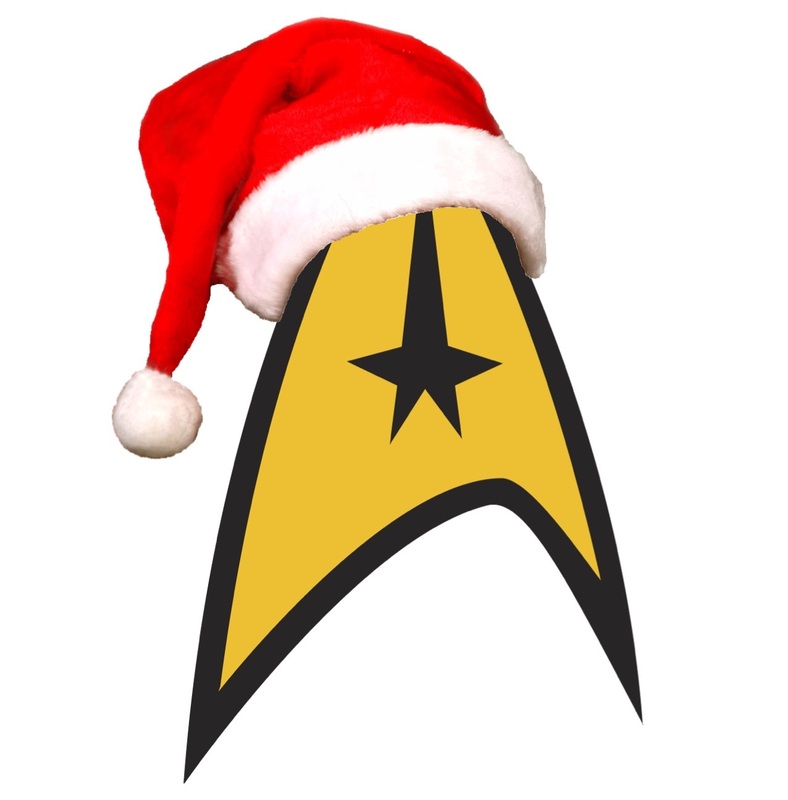 Box Text: A unique ornament – The runabout U.S.S. Rio Grande assigned to space station Deep Space Nine in the Alpha Quadrant, is beaming a greeting to Earth. 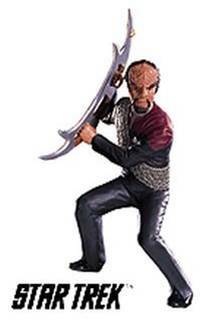 You’ll hear the voice of Strategic Operations Officer Worf (Michael Dorn). 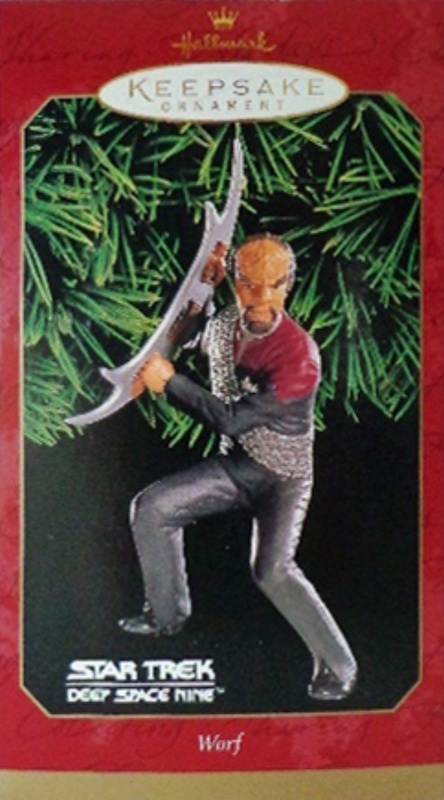 Worf is the first Klingon to serve in Starfleet. Here are his words: “I wish you a most honorable holiday. Qapla’!” (The expression Qapla’! 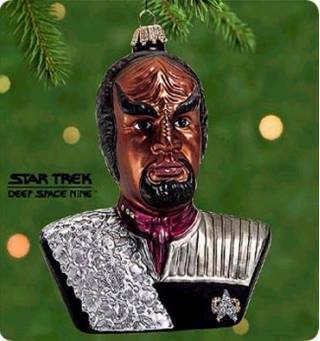 is the Klingon way of wishing you “Success!”) To hear Worf speak, press button on bottom of ornament. The message will play through one time and stop automatically. This entry was posted in 018) 1999 Rio Grande, 1999, Lynn Norton, Magic Voice & Light, Master List, Pigtail, Rio Grande, Ships, ST: DS9 (TV) on October 21, 2011 by garfieldandtrump. 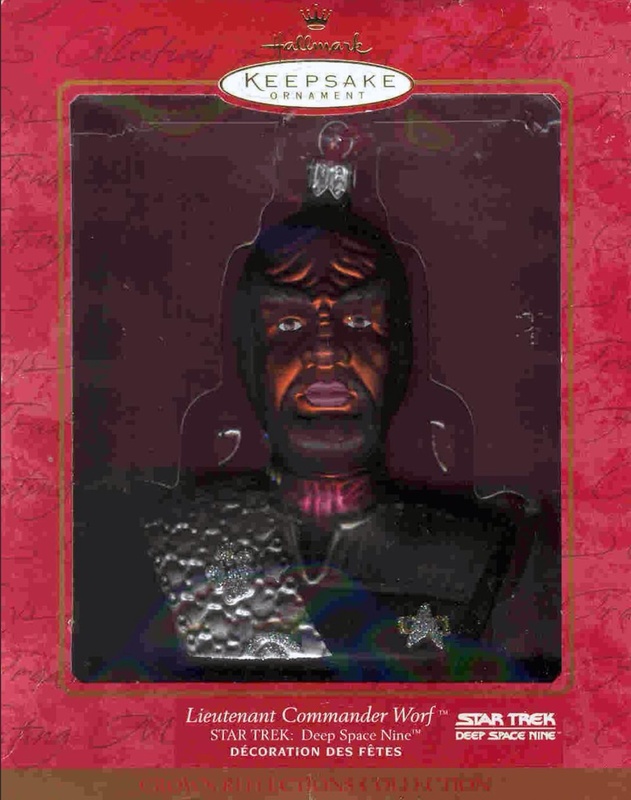 Box Text: A unique ornament – This powerful ship is stationed at Deep Space Nine, perhaps the most exciting post in the quadrant. 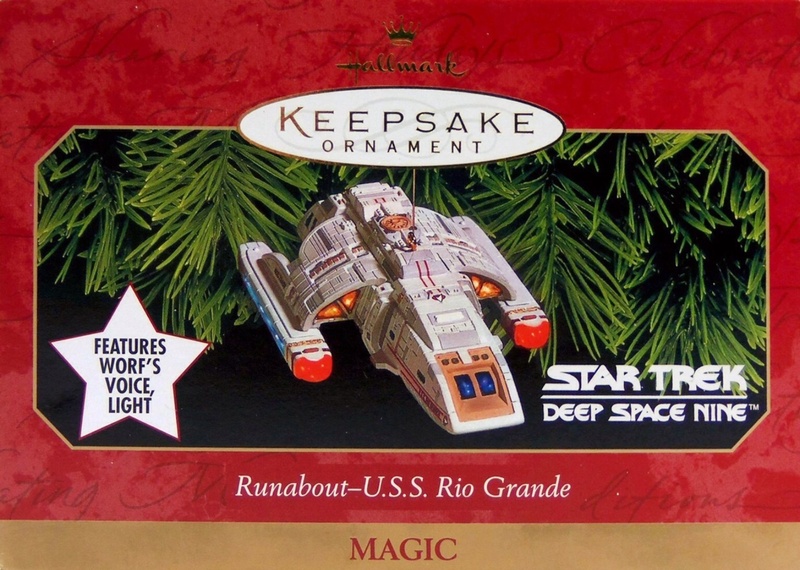 The blinking lights signal a greeting from the crew – adding a bit of Keepsake Magic to your holidays! 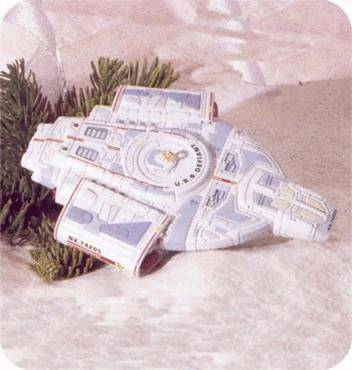 This entry was posted in 013) 1997 Defiant, 1997, Defiant Warship, Lynn Norton, Magic Light, Master List, Pigtail, Ships, ST: DS9 (TV) on October 21, 2011 by garfieldandtrump.